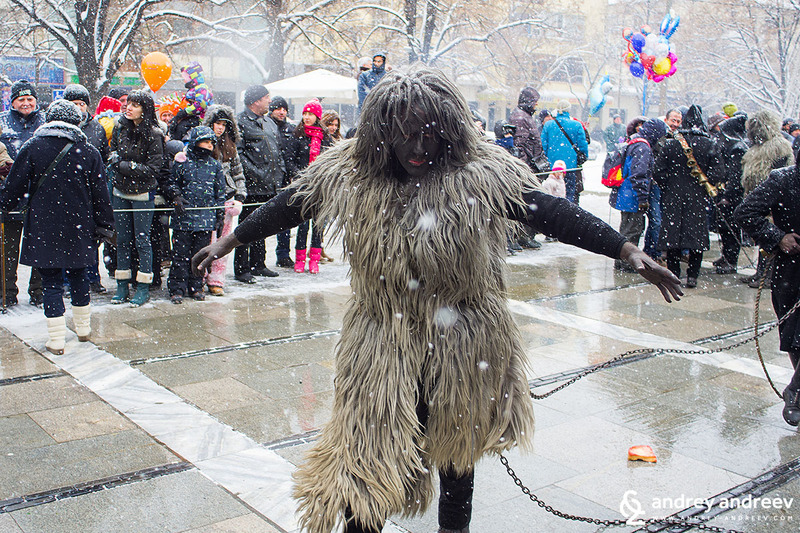 Surva carnival is one of the events I would rarely skip. 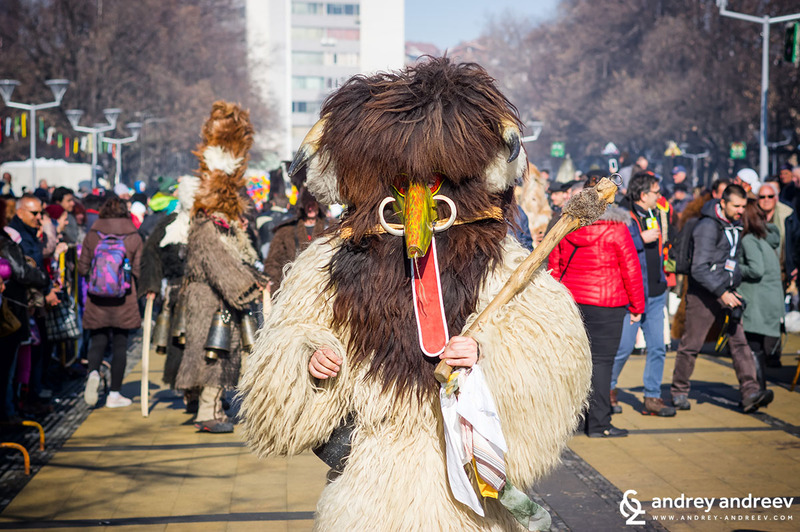 I really enjoy the numerous masked creatures dancing and making noise on the streets in order to chase away the evil spirits. 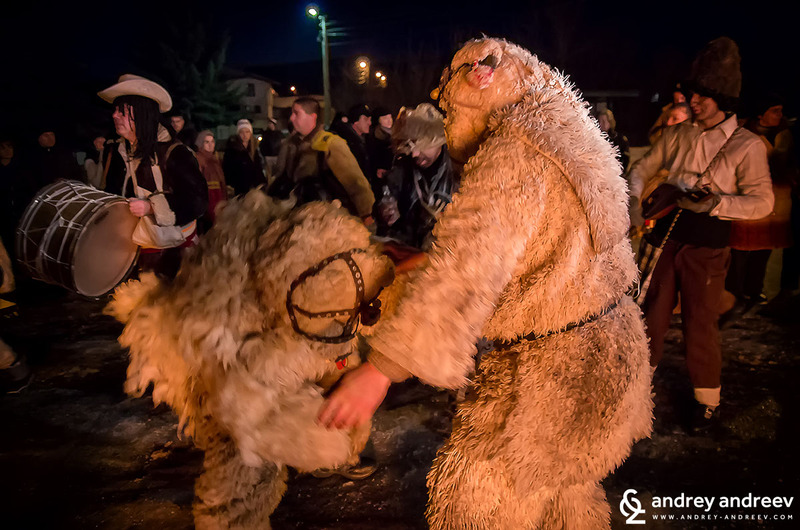 Even more I enjoy the indigenous rituals in the villages around Pernik on the night before 14 January. 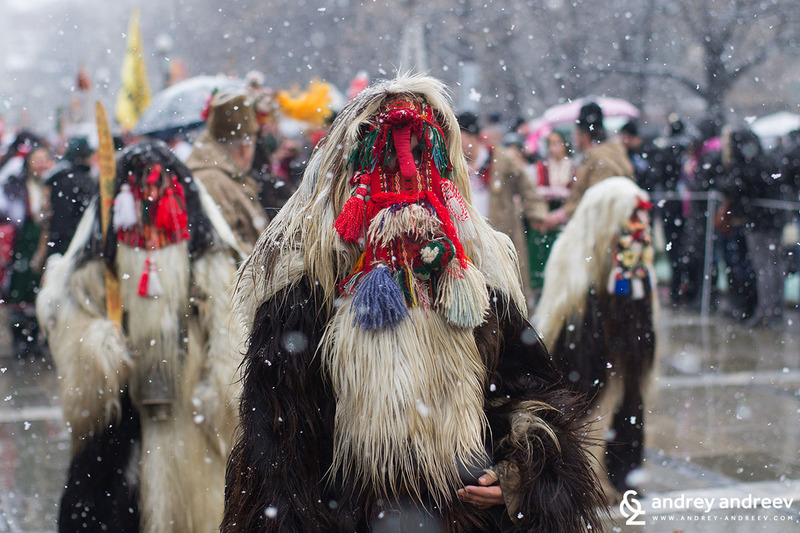 Surva is a colourful tradition that fills me with energy and makes me believe that they are really capable of chasing the evil away. 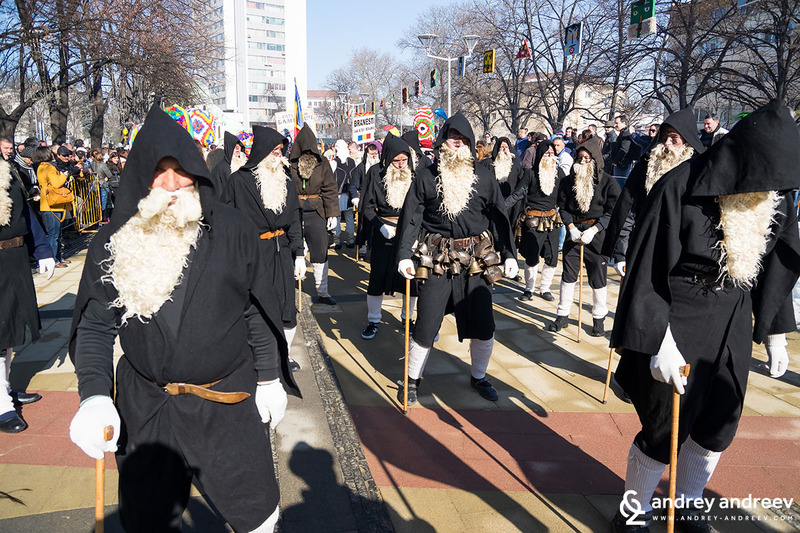 So every last weekend of January the city of Pernik turns into a home of scary masked men and women, bells ringing all around, not without a lot of rakia (Bulgarian traditional alcoholic drink) that warms the bodies and souls of everybody in the cold winter days. Well, I am a regular visitor, too. Every year I try to describe as well as possible what you are seeing on my pictures, instead of just sharing millions of photos headlined “Surva” as many other photographers do. This is not an easy job but I am trying to share all I know. 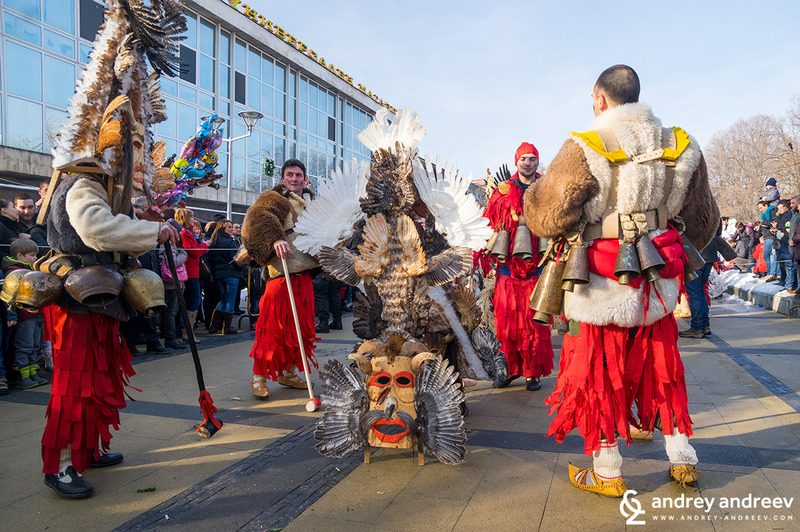 Surva carnival is held every year in late January of early February and lasts 3 days – Friday, Saturday and Sunday. 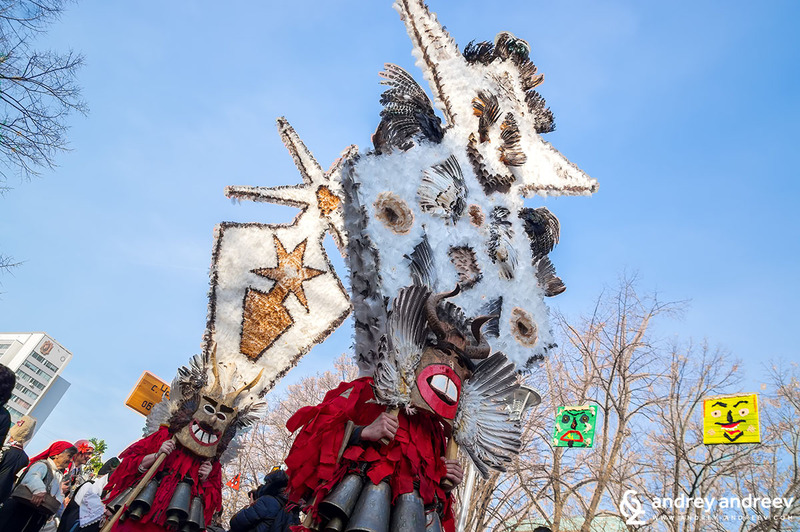 In 2019 will take place the 28th edition of the carnival and I believe it will be very funny again. The parade days are usually Saturday and Sunday and on Sunday afternoon is the awards ceremony. You can find more information about it on their website www.surva.org or their Facebook page www.facebook.com/survafest. /Facebook event/. 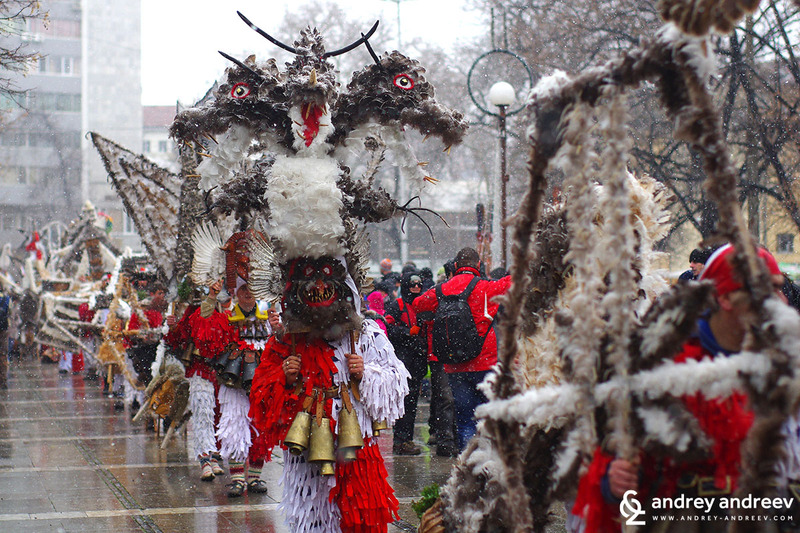 Not surprisingly, the Surva weekend is very busy around Pernik. 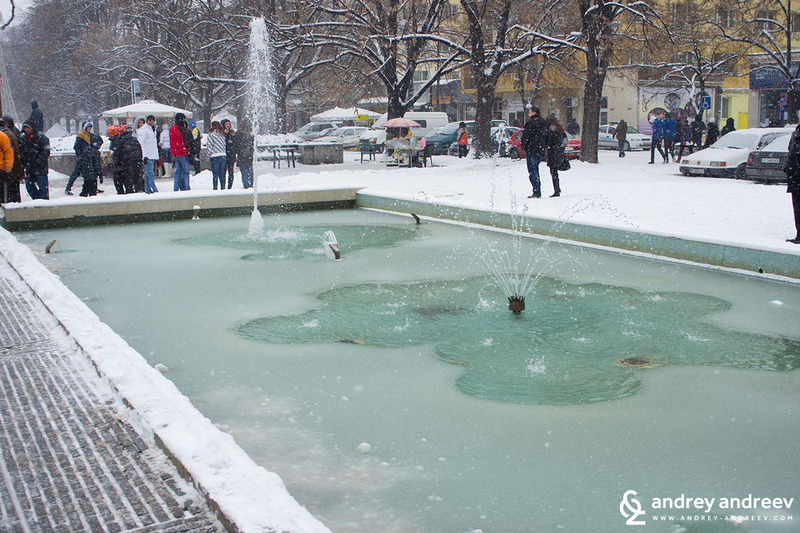 Parking is difficult around the centre of the city and I would suggest you take the comfortable train from Sofia to Pernik. Then the square where the parade takes place is big enough and there is space for everyone. Check the weather forecast in advance and prepare well. 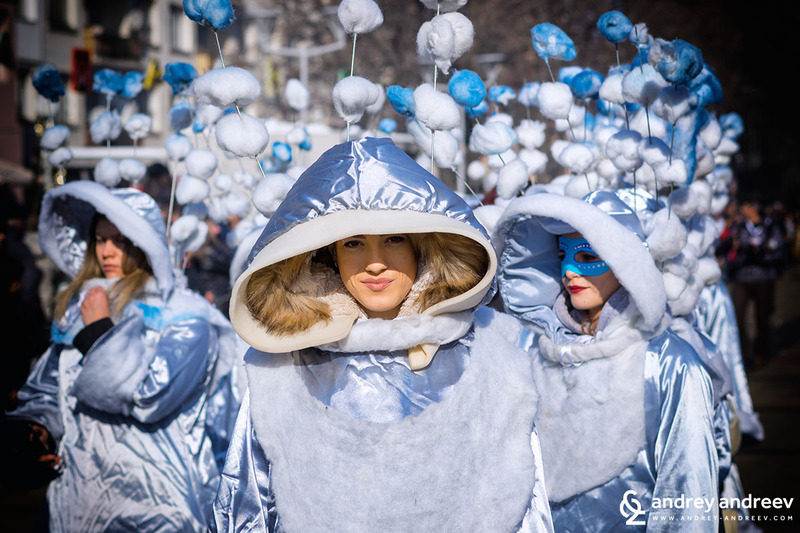 The temperature is usually below zero and you need really warm clothes if you intend to stay outside watching the parade for hours. 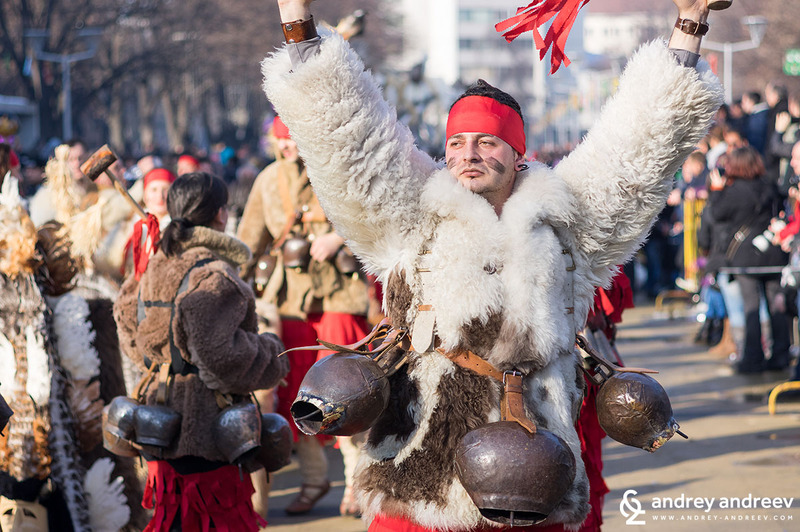 The participants might feel warm because of their costumes and the rakia, of course, but for spectators this can be a challenge. 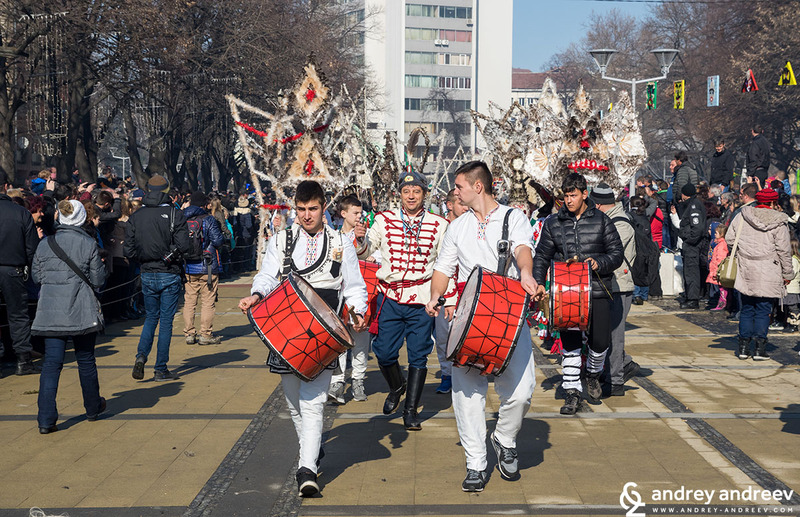 More than 100 groups usually take place in the Surva parade. The count of individual participants can reach 6000. 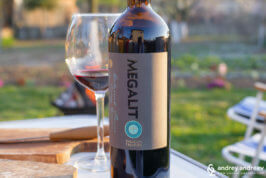 And despite most of them are Bulgaria, there are always attractive guests from foreign countries and continents. Below I will share some of the most impressive participants. 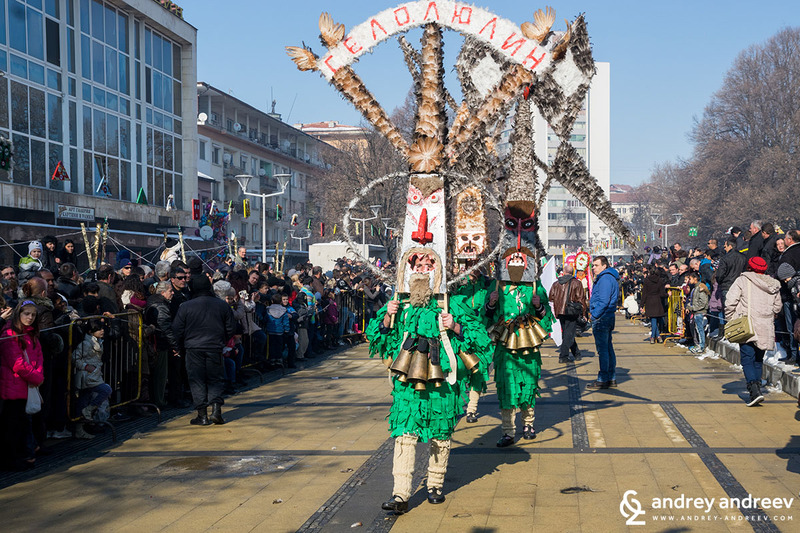 The Survakari group from Dolna Sekirna village won the Golden Mask prize on Surva carnival in 2016. 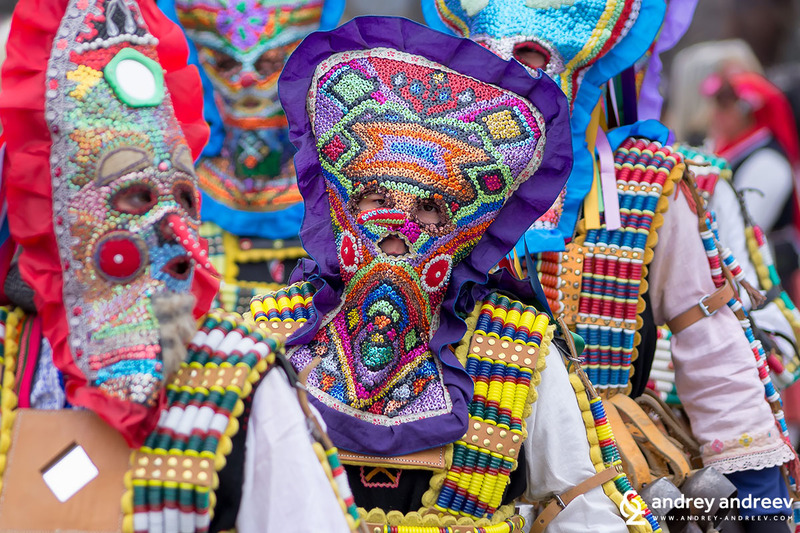 Their masks are hand-made by the participants themselves and members of their families. The costumes are made of rags and the scary masks are made of feathers. 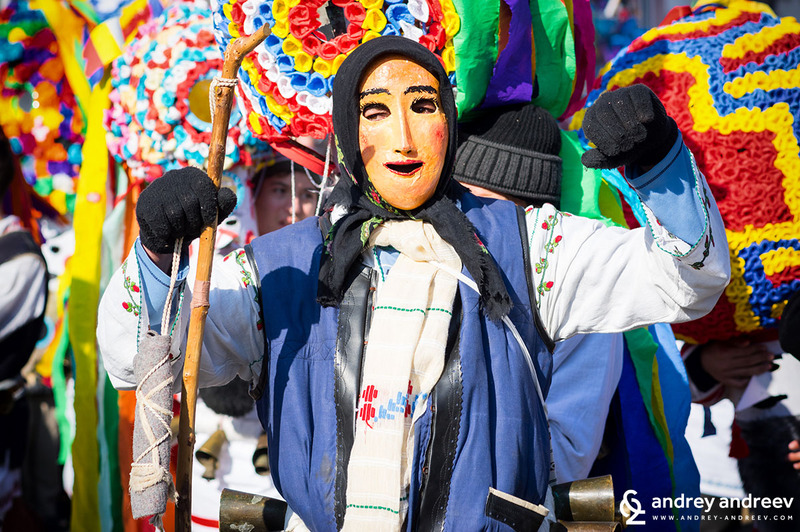 The Survakari festival in Dolna Sekirna is celebrated on January 14th – Saint Basil’s Day, old style. So if you visit the village in the evening of January 13th you will see the bonfire and Survakari dancing around it. And on the day of Jan. 14th they go from house to house to chase the evil spirits away. They usually perform a “wedding” scene, including the roles of bride and groom, priest, guests, bear, doctor and many others. 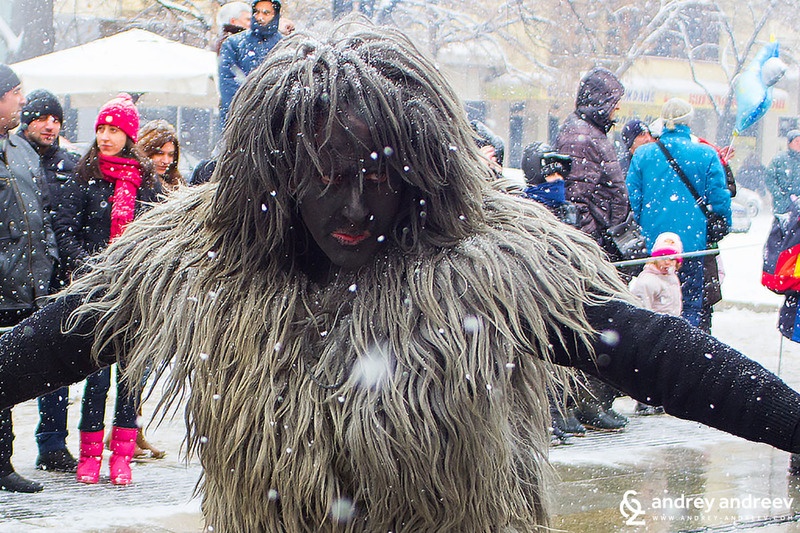 In Kliment village local Kukeri used to hold their celebrations on Cheesefare Sunday. 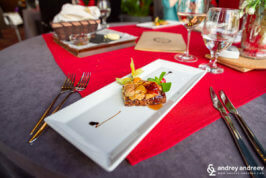 Recently the tradition has slightly changed and now the celebration is held on the Saturday before Cheesefare Sunday. 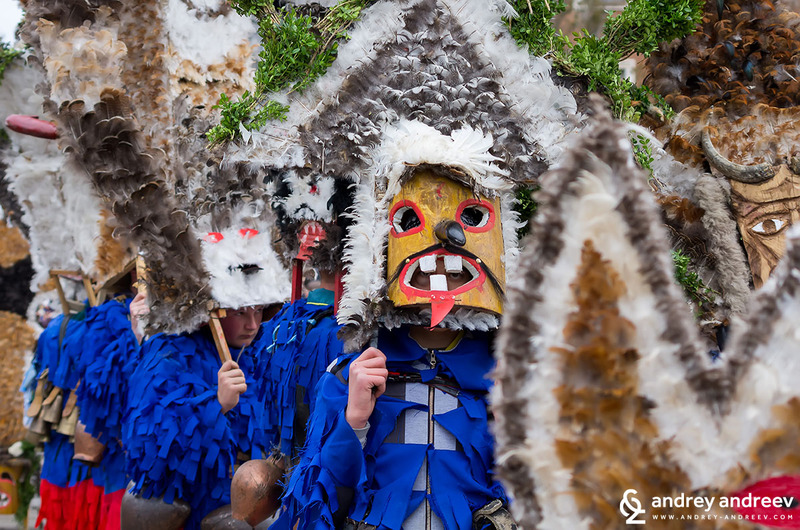 The Kukeri masks are made out of peaked caps and a wire base, decorated with artificial flowers and ribbons. The mask that covers the face is a wired mesh coloured in pink. Many Kukeri want to have moustaches painted on it as well. 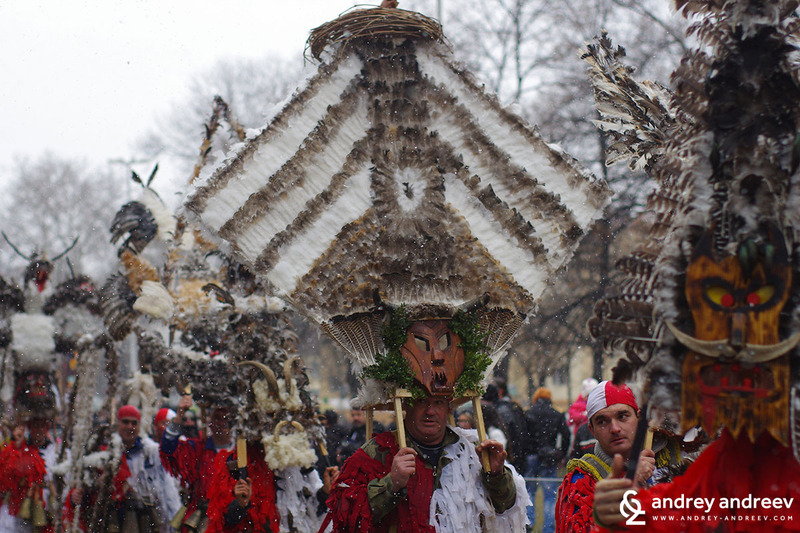 The Survakari from Lyulin village wear costumes made of green rags and very beautiful feathers masks. They also hold their celebrations on January 13. The Baburi from Domlyan village are among my favourites. I hope this year on Cheesefare Sunday I will be able to visit their village and see what their traditions look like. 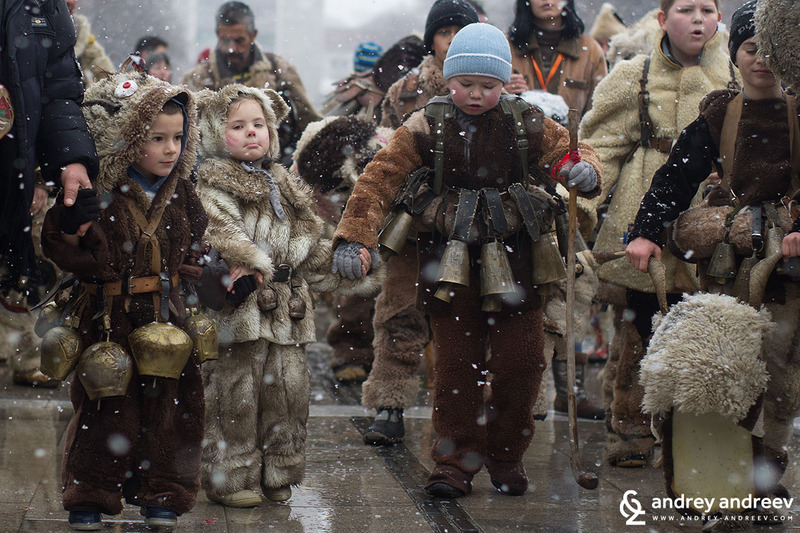 Their rituals are very similar to Halloween – they go from house to house and collect eggs, sweets and fruits. But this happens in the morning, instead of in the evening. In January 2015 the Russian magazine “Vokrug Sveta” published a picture of them made by me. 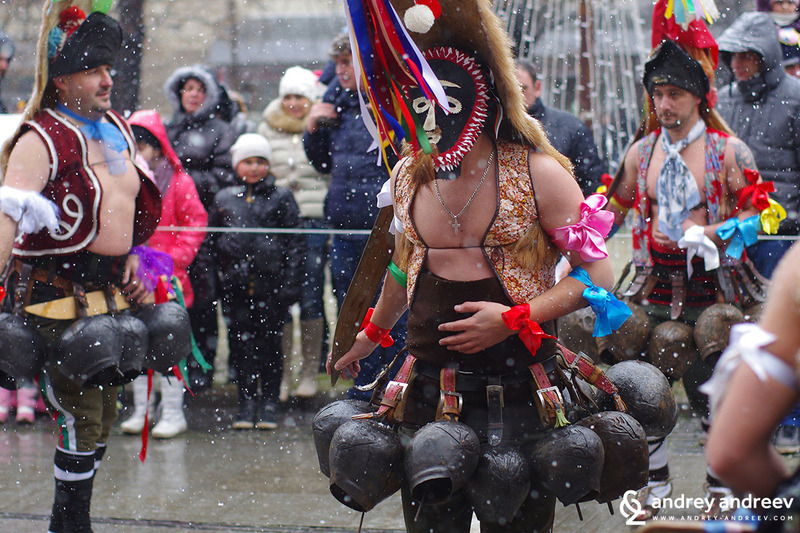 On Cheesefare Sunday in Osetenovo village the weather might be warm enough to wear these costumes but January has always looked quite cold in my opinion. Luckily that year the weather was nice. 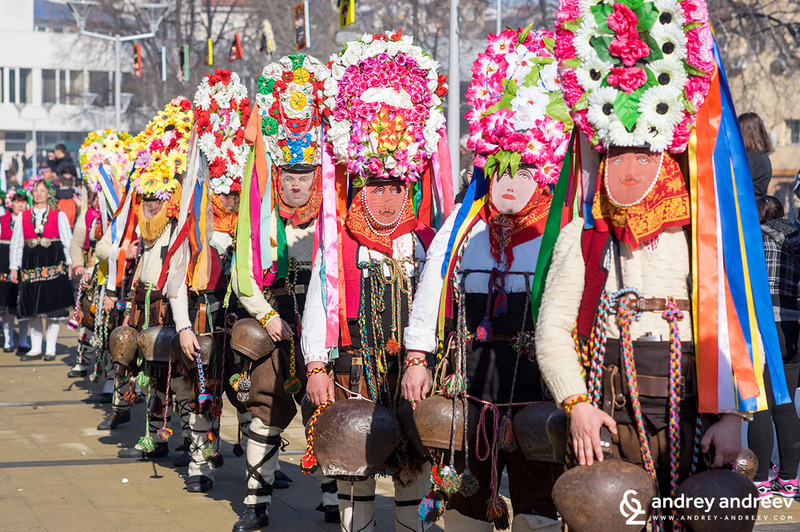 The Survakaru from Dragichevo are a relatively new group, created in 2002. However, they are not less attractive and colourful than other groups. 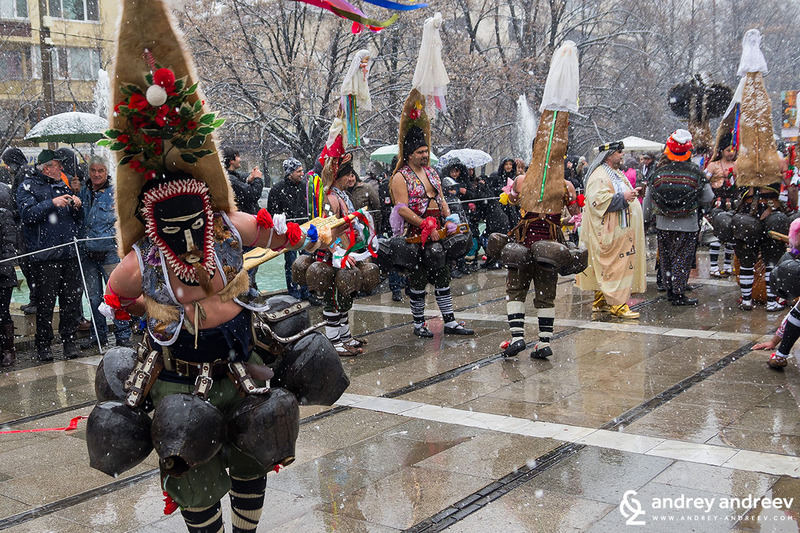 They are a traditional Survakari group that chases away evil spirits on 14th January, St. Basil’s day, old style. 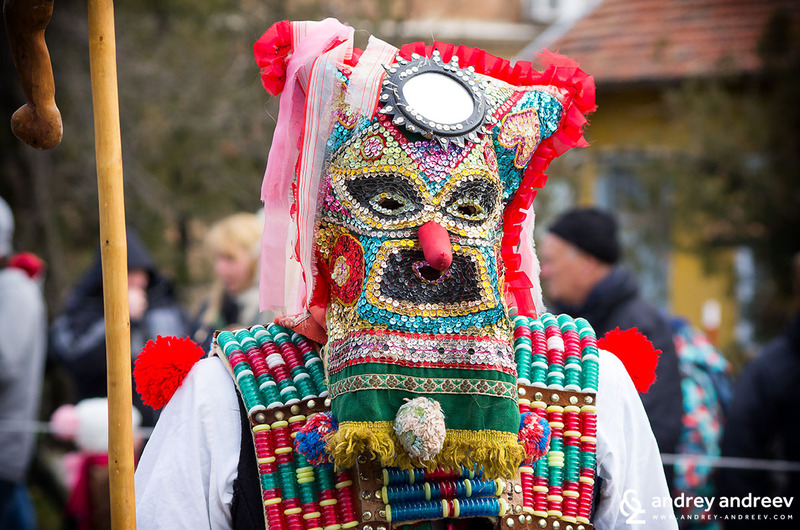 My passion about masquerade festivals started after a visit to Drugan village, near Radomir. 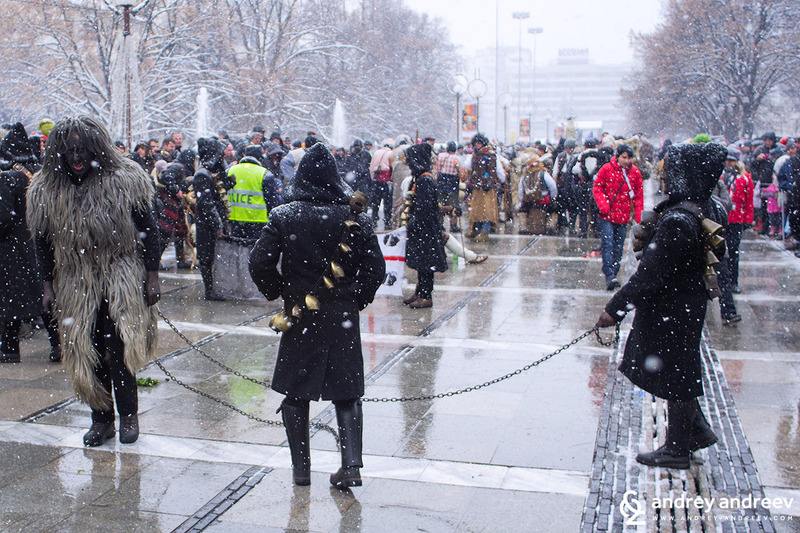 It happened on the eve of January 14 – the Old Style New Year. Here I witnessed the local masquerade traditions for the first time. I really enjoyed the big stake in the centre of the village with masked men playing and dancing around. they were dressed in rags, with huge masks made of feathers. 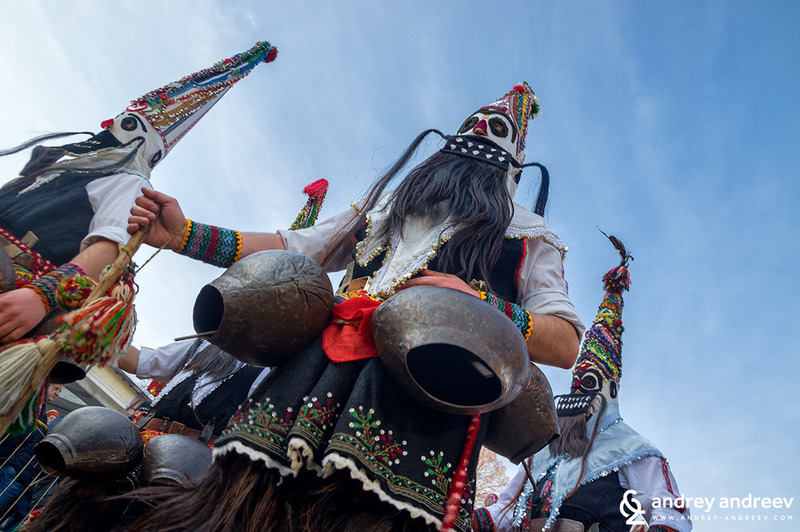 The celebration lasted a whole evening, including traditional Bulgarian dances like Horo. It was a great fun. The following day the masked monsters started going from house to house to chase the evil away. 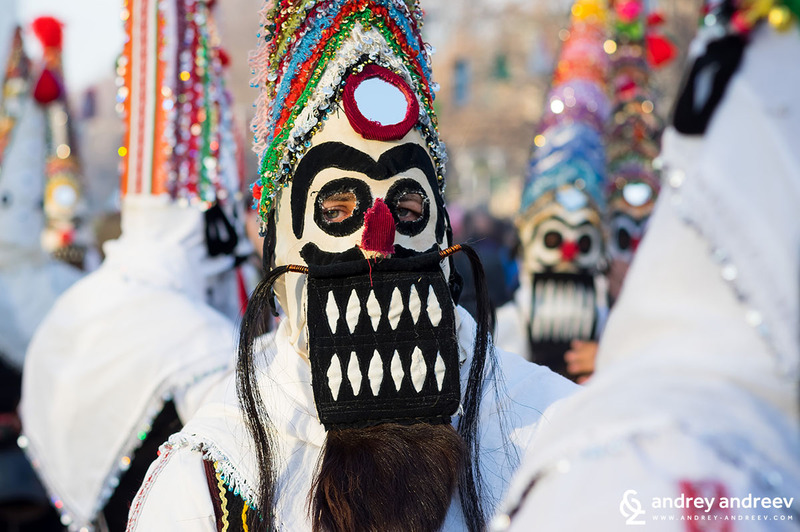 Surva Masquerade games“ in Drugan are held every year on 13 and 14 January. I have taken photos of two types of Kukeri from Sushitsa: left – Badjatsi, with tall conic hats and bells; right – Belogashi – wearing white pants and bells. I tried unsuccessfully to find any history about their name. They are probably grandchildren of refugees from Kavaklia village, now in Turkey, who settled in Dolno Ezerovo, a quarter of Burgas, Their custom includes plowing and seeding. 90 % of people in Branesti community are Bulgarians. They have wonderful colourful costumes. 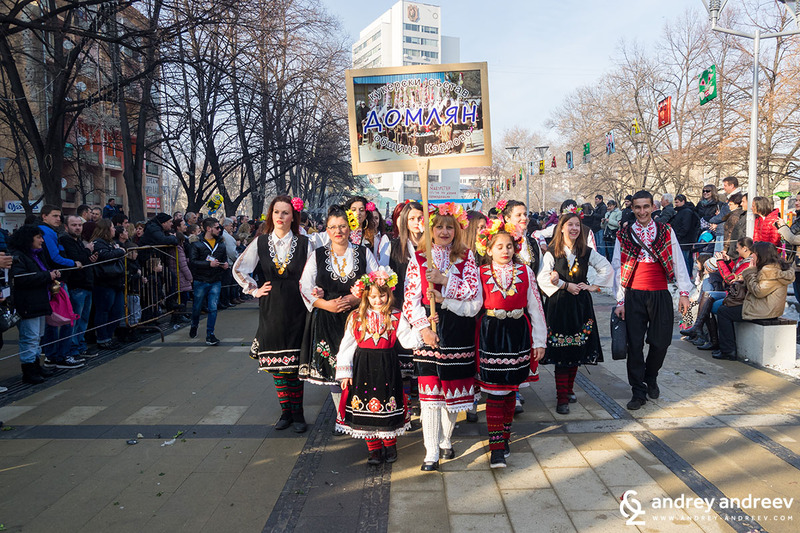 I was pleasantly surprised to find out about the Strumica carnival from several groups of nice Macedonian girls. 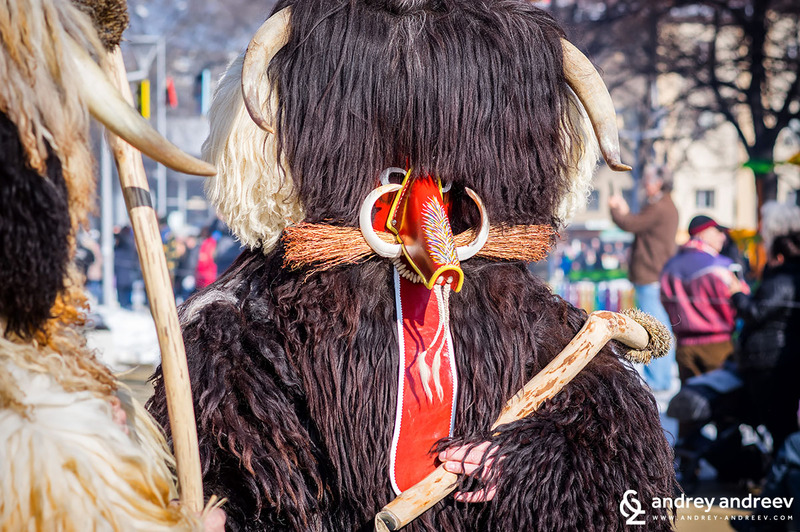 The tradition of local Kukeri includes colourful costumes, plowing, seeding and chasing the evil spirits away from home. 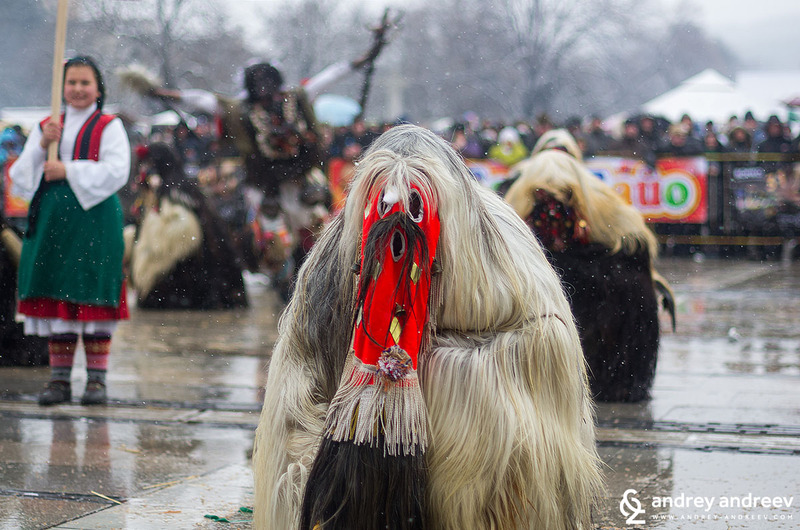 The Tsalamari tradition is almost the same like Survakari and Kukeri in Bulgaria – they light a big fire at the centre of the village and then dance, drink and eat around to chase the evil away. Only their costumes are different. They are among my favourites and I was lucky to have arrived on time for their performance. 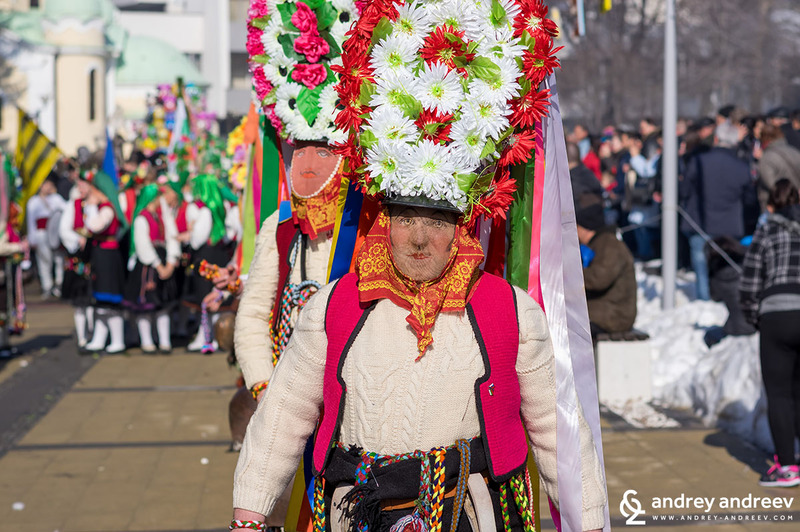 Every third weekend of February a Kukers’ festival is held in Chelnik. The participants urge the nature to wake up. Two of them harness themselves to the plow and plough the field. 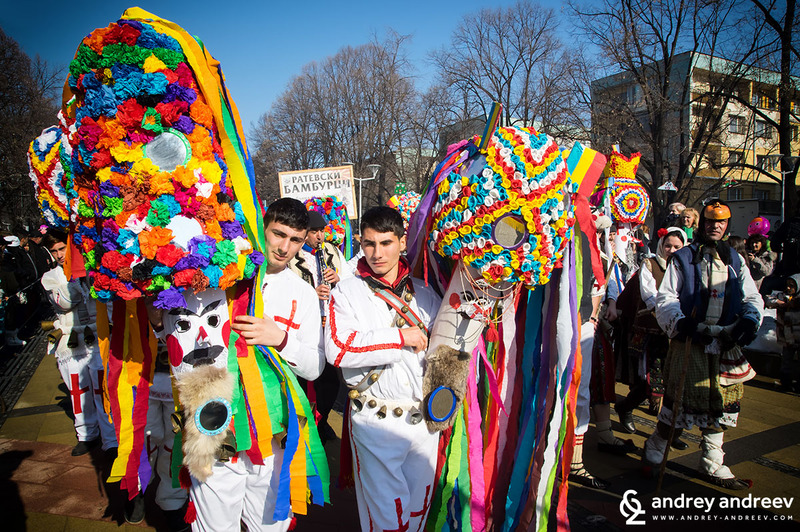 It is a very colourful tradition and worth seeing. 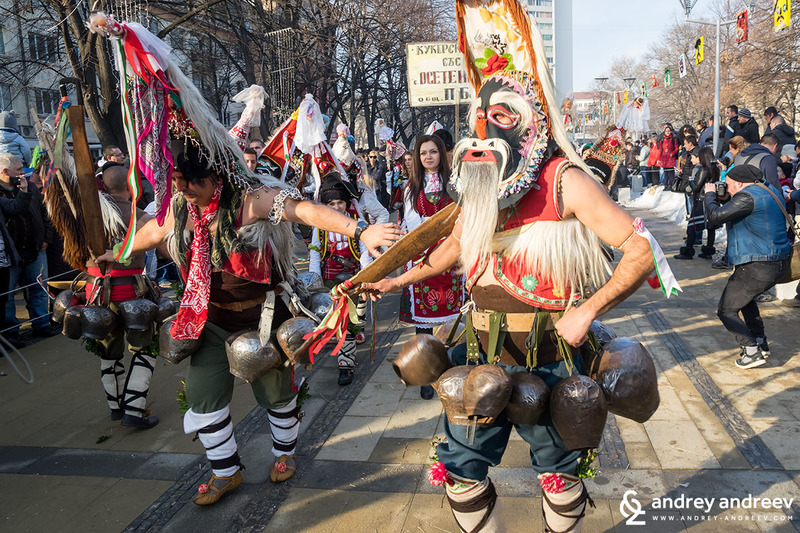 I have always liked this group with their musicians and traditional Bulgarian dances. They are a noisy and enthusiastic band with attractive masks and costumes. They also bring “wild bears”. I hadn’t heard of this type of masquerade traditions until a few years ago. 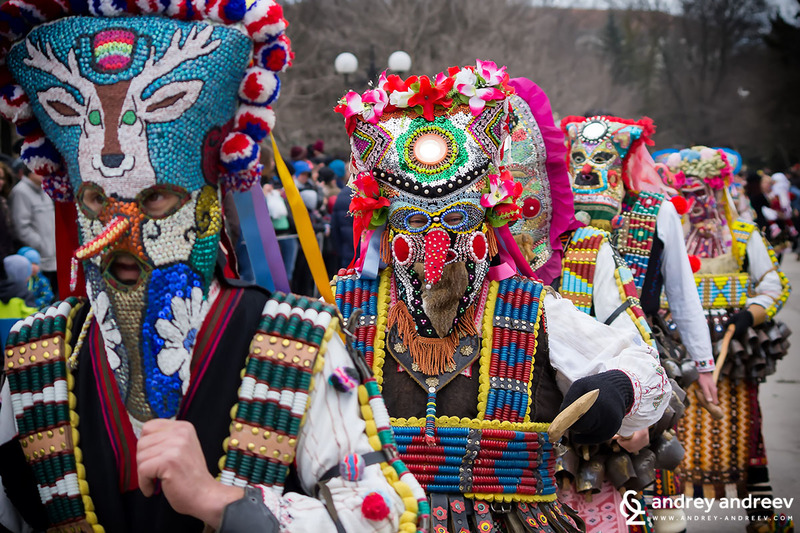 Their costumes are made of rags and their masks are decorated with feathers. 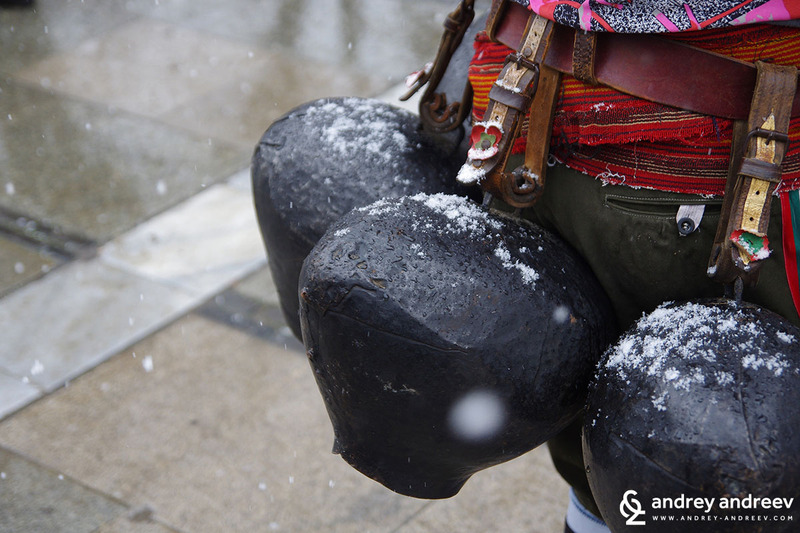 This tradition comes from the region of Pernik and Radomir in Western Bulgaria. 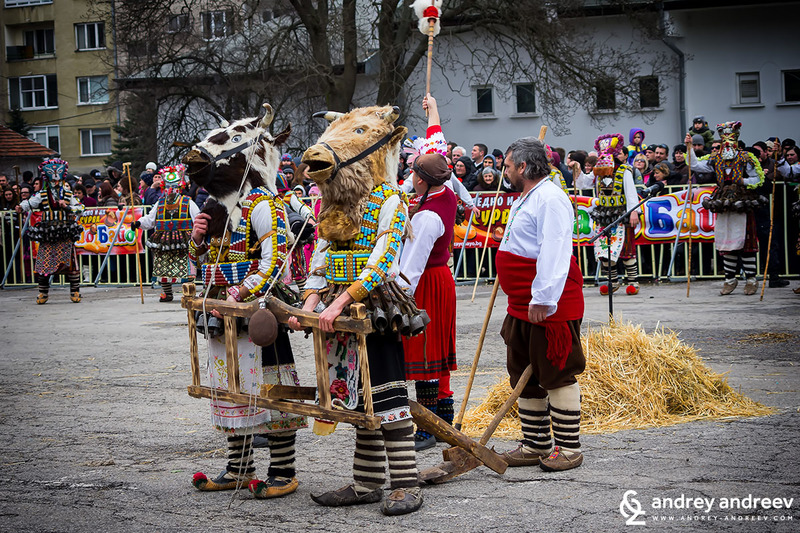 The performance in Golemo Buchino includes a “wedding” with people dressed as bride, groom and priest. 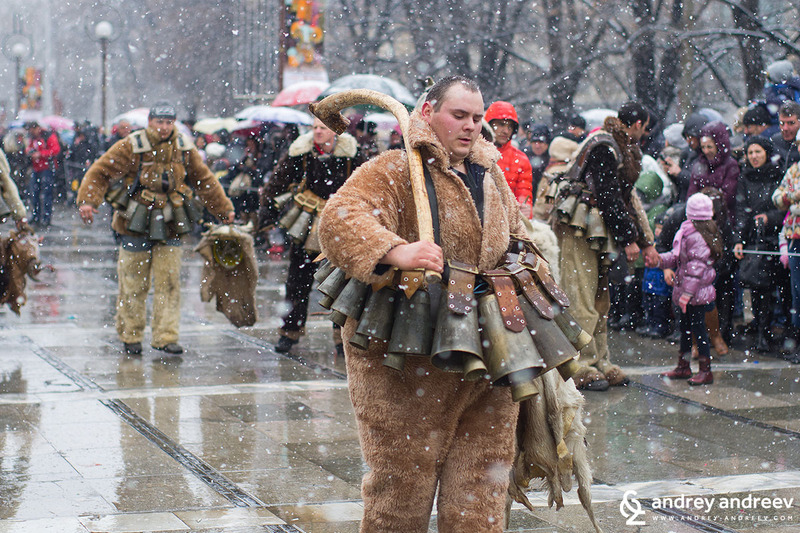 The ritual is held on January 13th – New Year’s eve (old style – by the Julian calendar). 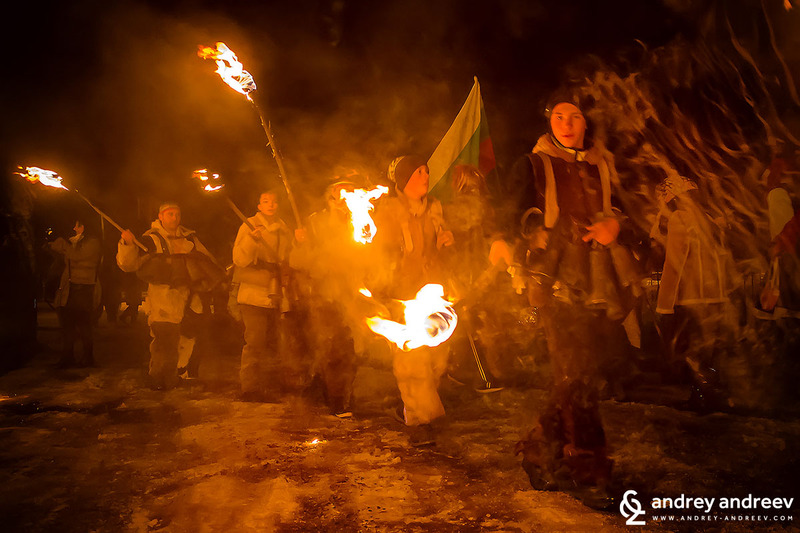 In 2015 we went to Cherna Gora village on a very cold evening on January 13th. 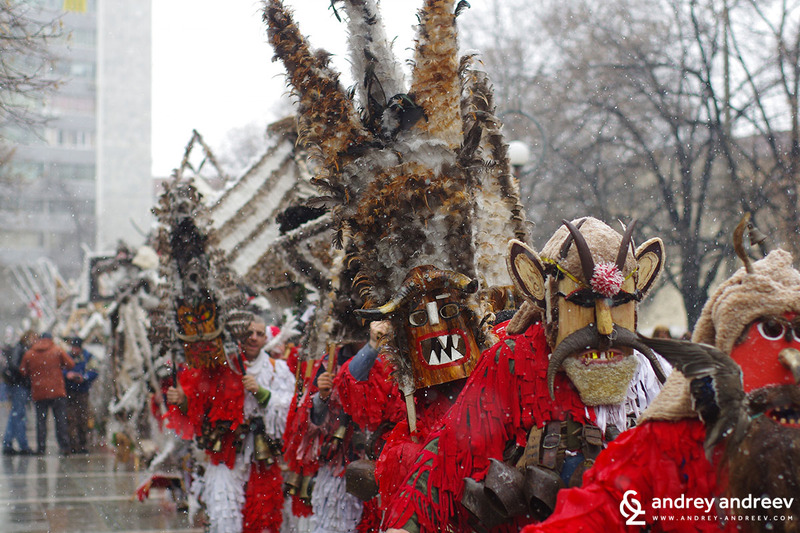 On this day the local people set a stake on fire and the Kukeri dance around it and make scary noise with their bells. On the other day they visit the houses of local people to scary away the evil spirits. 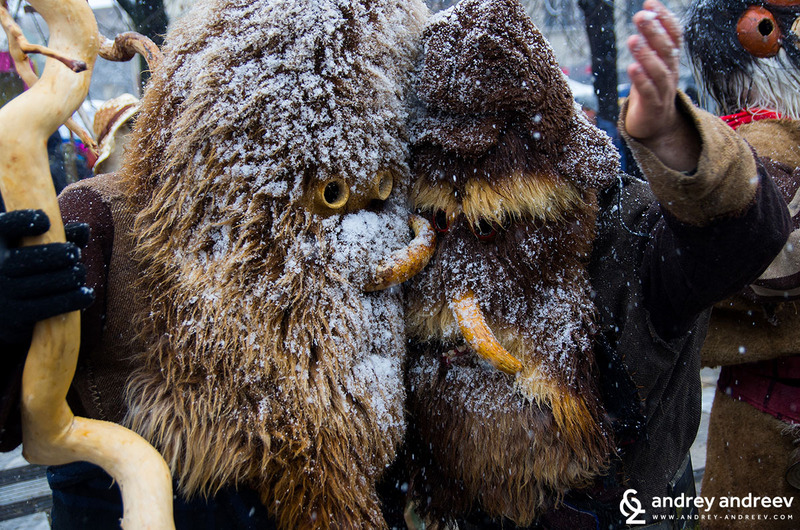 So on January 13th Kukeri from Cherna Gora and the neighbouring town of Bratanovtsi gathered around the stake. They also lit torches, made a lot of noise and we were not feeling the chill anymore. It is very difficult to organise your trip on this day because such celebrations are held in a lot of villages but at different times. Also, Kukeri groups often visit neighbouring villages. At first we tried to visit the celebrations in Bogdanovdol village but the stake was standing alone and unlit. The Kukeri had gone to another village. Finally we went to Batanovtsi where we enjoyed two stakes and lots of Kukeri. 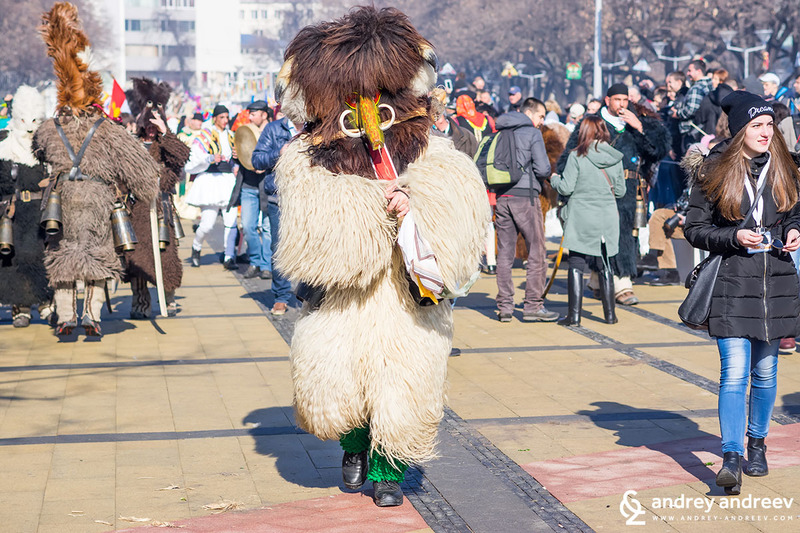 In Pavel Panya the Kukeri performances are held on Cheesefare Sunday. 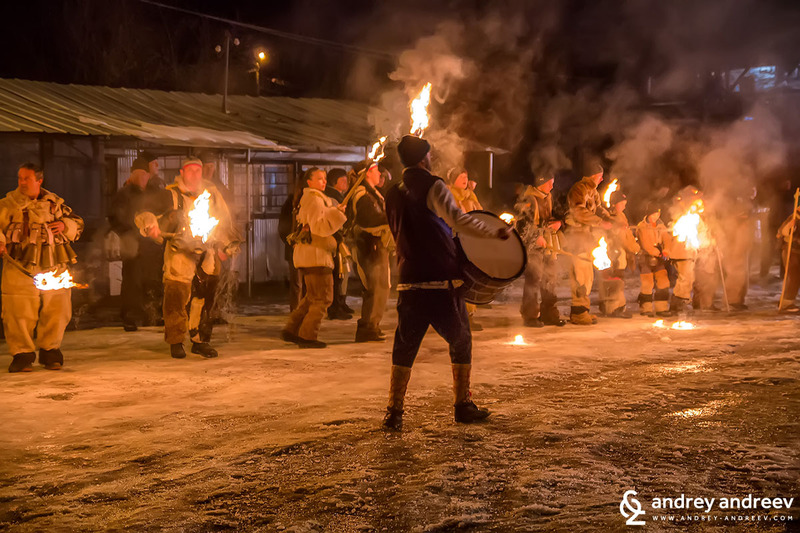 Every year on January 13 survakari from the villages of Bogdanov Dol and Leskovets gather around the big fire at the centre of the village. 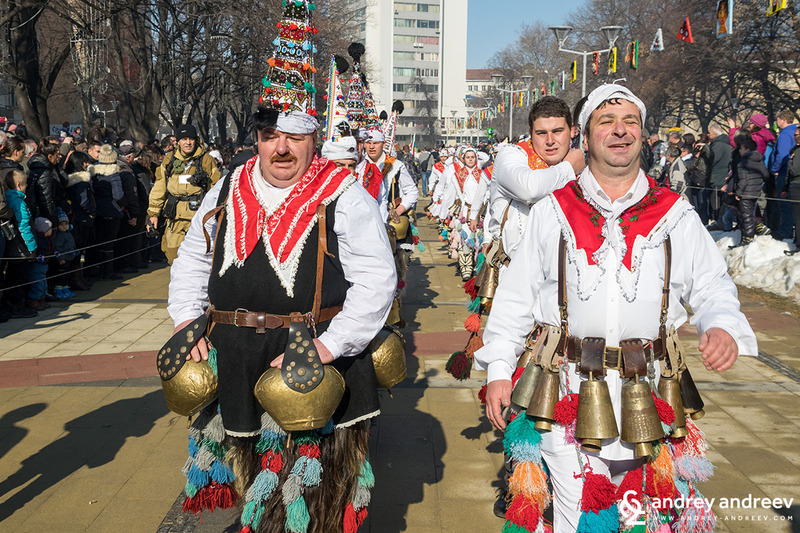 You can hear the bells all around the village and in the morning they start to go from house to house and receive gifts, rakia and money. 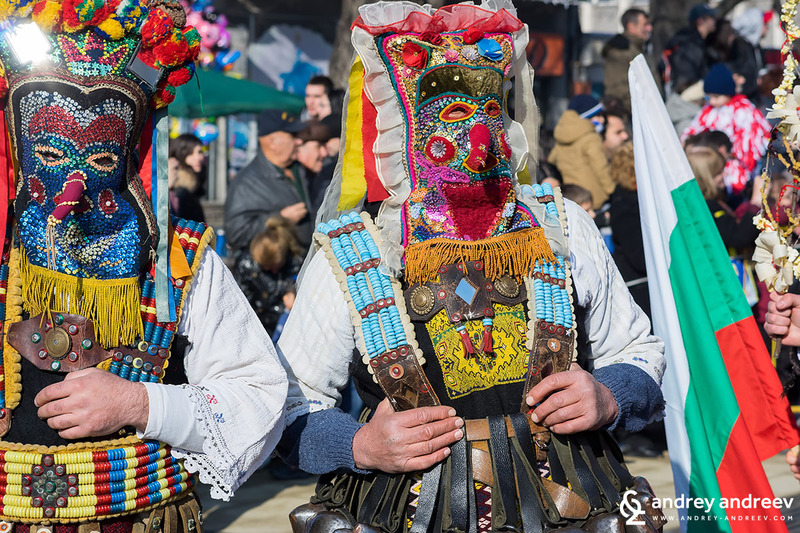 Their characters include bride, groom, priest, father-in-law, mother-in-law, bear, musicians and others. 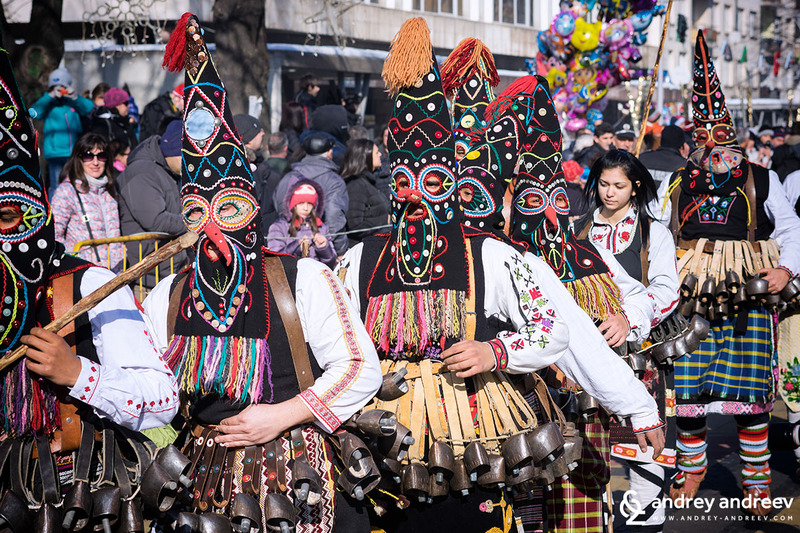 The masks and costumes are made by leather and have bells. All of this equipment might be as heavy as 85 kilos. 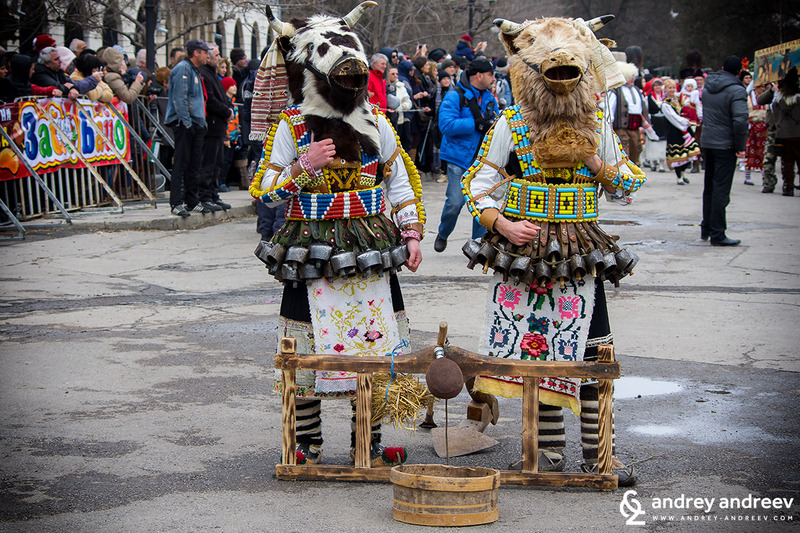 The performers from Lesichovo are known as Dervishi and they usually celebrate on Cheesefare Sunday. 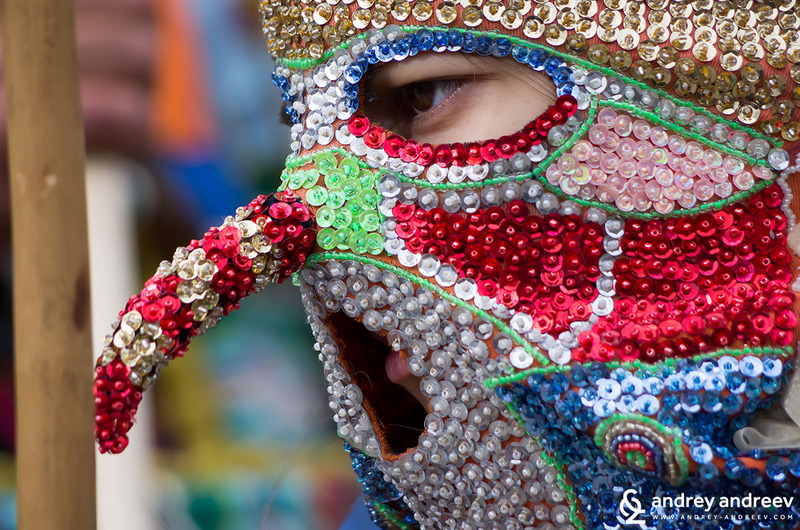 An old pagan tradition of playing masquerade games was implemented in the Christian rituals later. 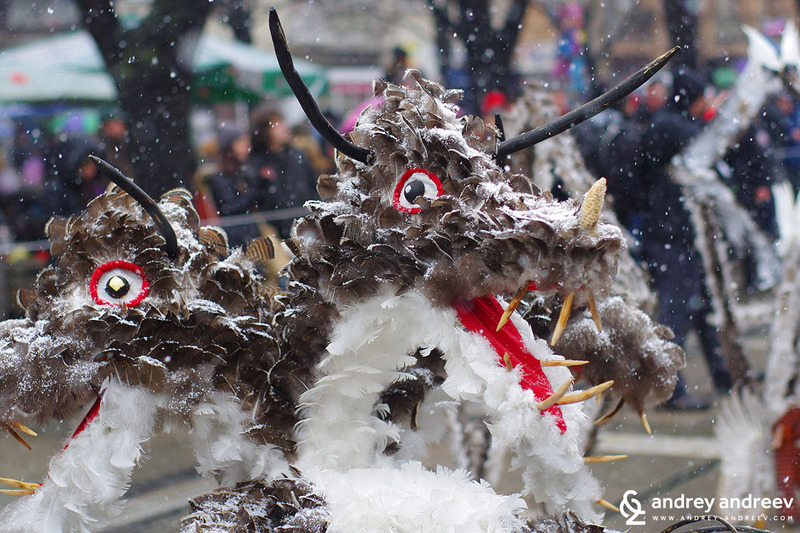 The performers make their costumes through the whole year. The garments are made of rags that are sewn just on the person. You can feel the festive mood weeks before the big celebration on Cheesefare Sunday. 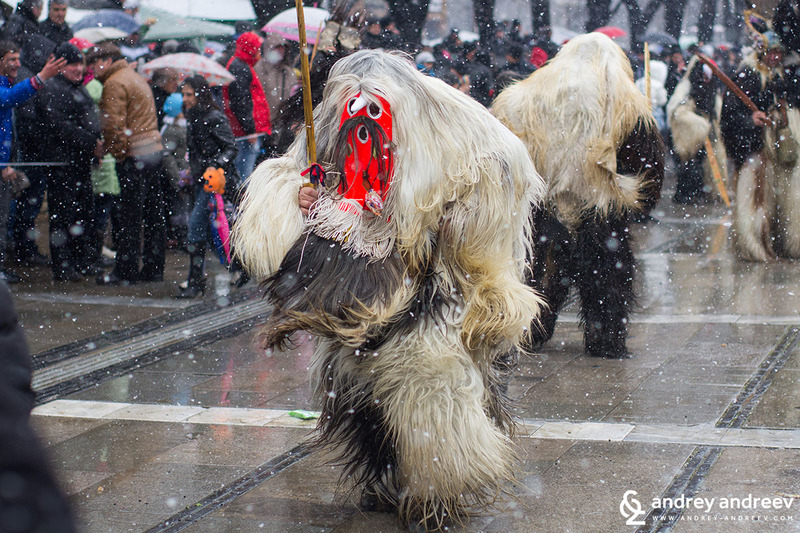 The kukeri start chasing the evil spirits the day before. 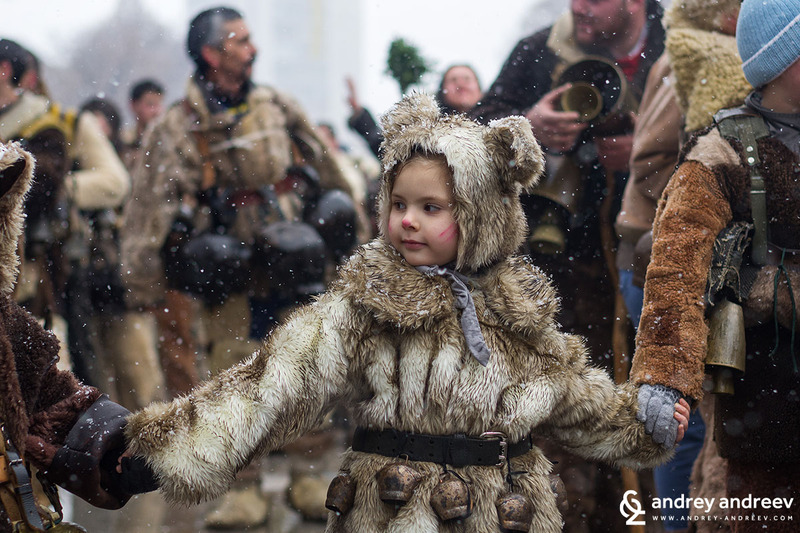 On Sunday they gather at the centre of the village, play and dance and wish health and luck. 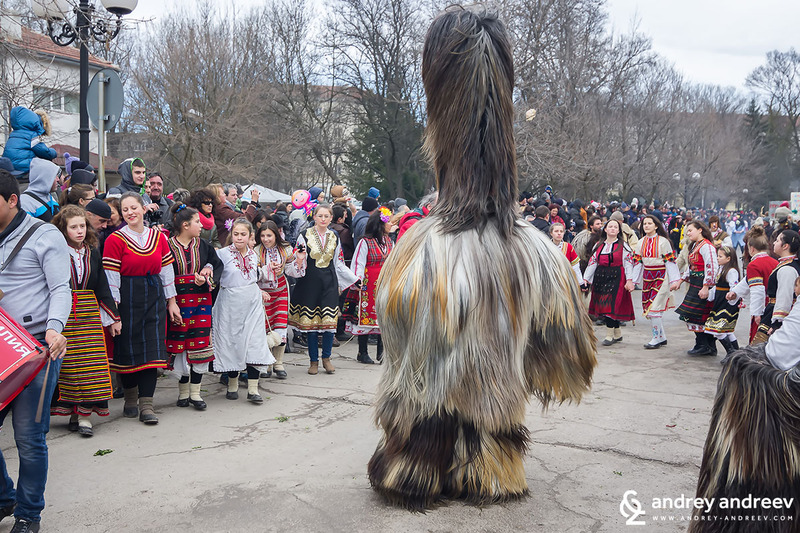 Kukeri are usually men, rarely women and children After the celebration they say the winter is gone and the spring can come. 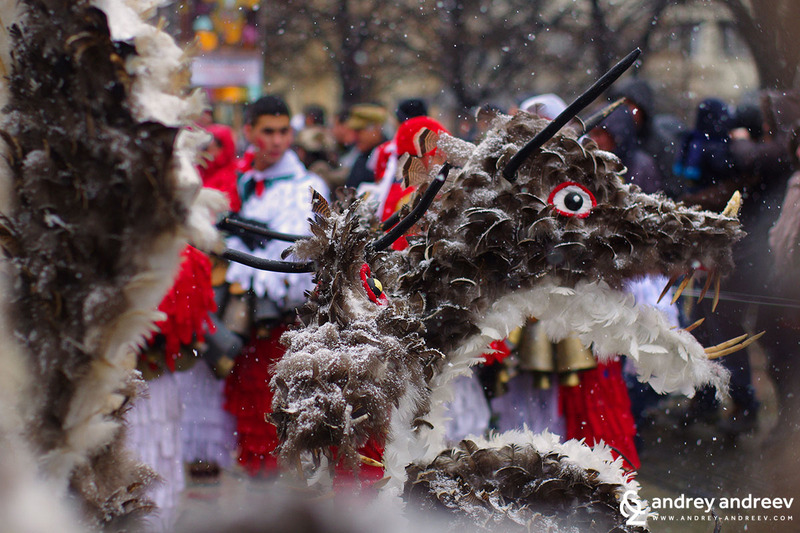 They come from the village of Fonni, Sardinia, Italy. 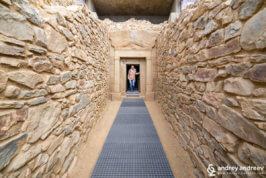 The tradition dates back to the 19th century. There are two types of characters – animals and their keepers. Urthos are the animals that try to escape and the Buttudos hold them in chains and try to tame them. Fantastic! And the photos are so life-like….